Today we are celebrating the 5th birthday of our identical twin girls, Chloe and Sidney. But our celebration is a little more meaningful than the normal birthday bash and few really know how bad it could have been . Chloe and Sidney might not have lived to see their first. Most people don’t know this, but Twin to Twin Transfusion Syndrome (TTTS) silently claims the lives of hundreds of identical twin babies each year. In simple terms, the blood and nutrients from the mother are shared unevenly between the babies. One umbilical chord is larger than the other and one baby usually out-grows the other. Eventually, one will starve to death and the other will simply drown in excess. By the time the mother notices a lack of movement in her belly it is usually too late. We personally know some people who had this exact thing happen recently. Nothing is sadder. On Thursday, the 18th of August 2005, (week 33 of the pregnancy) we had a sonogram done with our incredible doctor who was concerned that one baby had been getting larger than the other over the course of the last two weekly visits. After taking more time than usual looking at the results, Dr. Neill quickly dispatched us to a specialist who had the equipment to look deeper into things. The next day we arrived for our appointment. A few hours later the doctor didn’t like what he was seeing and told us the girls needed to join our world quickly. Signs of TTTS were taking place and we could take no chances. 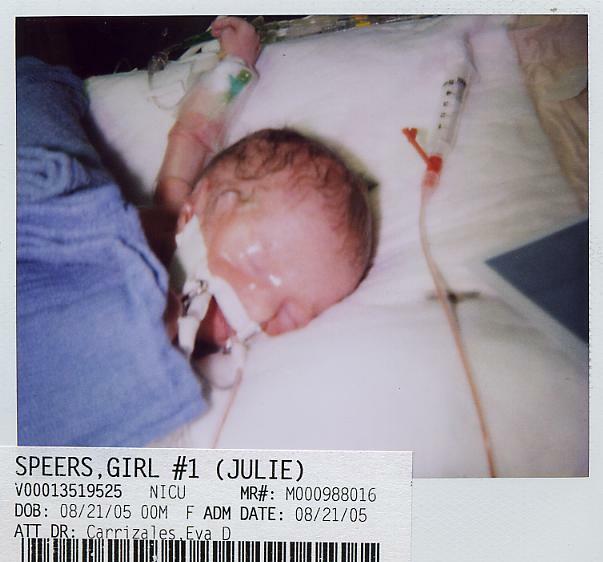 The girls needed to be monitored 24/7 and Julie needed to be at the hospital so that if something happened the babies could be taken within minutes. He told us to proceed directly to the hospital. Hearts racing we rushed home, grabbed our things and anxiously headed to Arlington Memorial. After two nights of starring at the heart monitors making sure the beeps never stopped, Sunday morning arrived and our girls were born. Dr. Neill grabbed Chloe (above picture girl#1) first at 8:58am weighing just 3lbs, 5oz and 18 seconds later Sidney came out weighing 4lbs, 11oz. Sidney immediately started crying and looked red and large. Dr. Neill even said “she is much bigger than we thought she was”. Chloe on the other hand was not even breathing; looked lifeless and pale. Dr. Neill looked over his shoulder very concerned. I was standing there watching it all and caring for Julie. My head was spinning trying to take in all the activity. Nurses began slapping Chloe to wake her up and get her going, while giving her oxygen. Seconds went by and soon a few minutes with nothing. Finally a small cry came out. Our little fighter was alive. Dr. Neill relaxed and I nearly fainted. 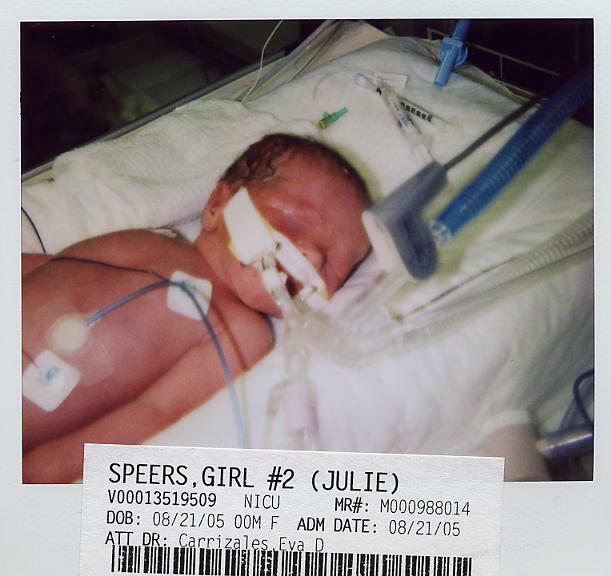 The girls were whisked out to NICU and I left the room while they cleaned up Julie. Poor wife had no idea all that was going on but it was hitting me at full throttle. I hugged my mom and cried. It was gonna be touch and go with our little Chloe. After a few weeks of NICU care, both girls were able to go home. Chloe would likely be smaller than Sidney for a while, if not forever, but TTTS had been outsmarted which was a miracle. And know you know why we call them our little miracles. Our girls are suddenly five. Really? That’s impossible. Yet it is true – Chloe and Sidney are now F-I-V-E.
Our little babies are now little girls. Yet they will always be our babies. Happy Birthday girls. You mean more to mom and I than you could ever imagine. You have brought us much laughter and joy. I fear everything from pesticides to power lines and I’m starting to act like my mother. I go home and even the goldfish scowls at me.